​​The Buckingham House is located in the Town of Deep River. Deep River lies in southern Connecticut on the Connecticut River. Formerly called Eight Mile Meadow or Patapaug Quarter, the area was originally part of Saybrook Colony. In the mid-nineteenth century various portions of Saybrook Colony broke off as separate towns. The town of Saybrook was formed in 1859. In 1947, Saybrook changed its name to “Deep River”, matching the name of the village in the center of town. 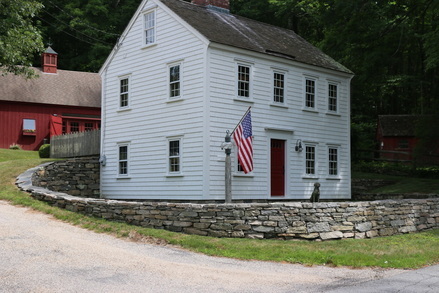 The Buckingham House was built by Hosmer Buckingham around 1800. Hosmer, a farmer, was married to Lily Snow. They had five children: Anna, Polly, Richard, Hosmer and Aaron. Hosmer Buckingham was a descendant of the Reverend Thomas Buckingham (1646-1709) and Hester Hosmer. Thomas Buckingham was the Pastor of the Church of Christ Saybrook and a founding trustee of Yale College at Saybrook and later at New Haven. In 1836, the house was sold to Hosmer Saunders. Town records list him as a farmer who was born in Hadlyme, Connecticut. The name Hosmer suggests that he might have been related to the Buckinghams, but this is speculation. The Saunders family owned the house for 93 years. ​In 1929, William Saunders sold the house to Douglas John Connah and Dorothy Hardy Connah. John Connah was and artist and art educator. He studied in Paris, Dusseldorf, and in New York City with William Merritt Chase. Connah went on to direct the school started by Chase. This school was known through a succession of titles: Chase School (1896-1898); New York School of Art (1898-1909); New York School of Fine and Applied Art (1909-1936); Parsons School of Design (1936-2005); and finally Parsons the New School for Design. Connah also directed the Shinnecock Hills Summer School of Art, as well as summer schools in Windsor Mountain, Vermont and Cape Cod, Massachusetts. In 1925, John Connah and Dorothy Hardy Connah began co-directing The New York School of Design. A 1933 New York Times advertisement mentions New York School of Design summer classes being offered in Deep River, Connecticut.